Policing in Baltimore has been plagued by corruption, violence and a lack of accountability. The Baltimore Uprising in 2015 sought to respond to these controversies, but has anything changed since then? What are the fresh challenges that arise from the possibility of Johns Hopkins itself instituting a private police force? What has affected attitudes towards policing in Baltimore? And what alternatives to policing have emerged both in Baltimore and in other cities? Vesla Weaver is Bloomberg Distinguished Associate Professor of Political Science and Sociology at Johns Hopkins University. In her scholarly work she has contributed to debates around the persistence of racial inequality, colorism in the United States, the causes and consequences of the dramatic rise in prisons, and the consequences of rising economic polarization. Weaver was at the forefront of early scholarship on punishment and surveillance in America when others argued that these were not priority themes in political science. She argues that these were central to American citizenship in the modern era, played a major role in the post-war expansion of state institutions, were a key aspect of how mostly disadvantaged citizens interact with government, and were a political “frontlash” to make an end-run around civil rights advances. Tara Huffman is the Director of the Criminal and Juvenile Justice Program at OSI-Baltimore. In her work she focuses specifically on reforming policies and practices that contribute to racial disparities, an over-reliance on incarceration and blocked opportunities, and finding alternatives to current policing practices in Baltimore. Prior to joining OSI, Huffman worked on criminal and juvenile justice with advocacy and grassroots organizations in Baltimore and Washington, D.C. A graduate of the University of Maryland School of Law, Huffman began her career as a Staff Attorney at the Public Justice Center. In 2016, she was appointed to the Maryland State Advisory Committee to the United States Commission on Civil Rights. Lawrence Grandpre is Director of Research for Leaders of a Beautiful Struggle, a grassroots think-tank working on issues that advance the interests of Black people in Baltimore through youth leadership development, political advocacy, and autonomous intellectual innovation. He focuses on how to facilitate effective political awareness campaigns, organized civil demonstrations, community education events, and legislative advocacy efforts for policy reforms that impact Black people in Baltimore. He has been active in grassroots anti-policing work. In 2014, Grandpre co-authored The Black Book: Reflections from the Baltimore Grassroots with Dayvon Love. Mira Wattal is a junior at Johns Hopkins University, majoring in math and philosophy. She has been involved in the student-led coalition Students Against Private Police (SAPP) since its very beginning. 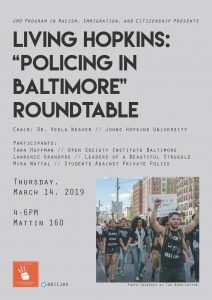 SAPP was formed after the March 2018 ‘surprise’ announcement by Johns Hopkins administrators that they intent to create a private police force. 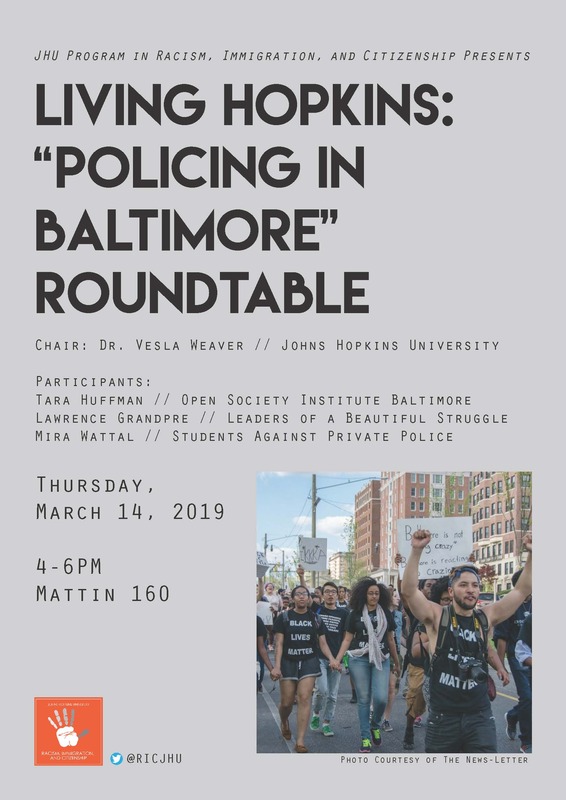 It brings together more than ten student groups to organize against Hopkins’ attempts to form its own private police force. They have attended and held student and community forums, established relationships with community-driven organizations such as the Baltimore Redevelopment Action Coalition for Empowerment and Leaders of a Beautiful Struggle, and organized phone-banks, canvasses, and rallies. Despite the unfavorable legislative outcomes, neither she nor SAPP will stop their organizing work.